Tech&Learning is a great resource for educators. It is a print/online magazine, along with a great website. They also produce TechForum educational conferences and Virtual TechForum. 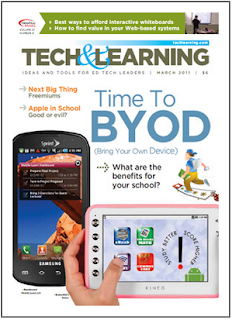 The website has a link to the electronic version of the magazine, the Tech&Learning Advisor blogs, links to resources from past TechForums, and more resources. There are articles on best practices, administration, integrating technology, professional development, free resources, tips and tricks, grant help, and so much more. The Tech&Learning Advisors are educators who write articles for the TL Blog section of the website, contribute articles to the magazine, and also help review products and present at TechForum. Some of the names may be familiar to you as they are also very active online with Twitter and their own blogs and present extensively at conferences and unconferences around the world. The staff are friendly and helpful, the TechForum conferences are great, fun, and informative, and the site and magazine have incredible information and resources. Tech&Learning also maintains a presence on Facebook and Twitter. Tech&Learning is an excellent resource for all educators. It's free and contains a tremendous amount of information, links, resources, and tips and ideas. I've written about Tech&Learning before, but never on it's own. I believe that it is a tremendous resource for educators and wanted to make sure more educators could take advantage of it. Note: I am a TL Advisor and contribute twice monthly to the TL Advisor blogs. I have also have articles of mine published in the print magazine and present at TechForum.